Same day belt making and shipping service is available on all standard size belting. In stock items on orders placed before 11:00 AM Central Time will typically ship the same day. Otherwise, it will ship within 24 hours Monday through Friday excluding holidays. Once your items have shipped, a tracking number will be sent via email with a link to track your shipment. Free Shipping only applies to items marked for free shipping and utilizes UPS Ground to the 48 Continental Unites States (excludes Hawaii, Alaska and Puerto Rico). All other items in the shipping cart will be charged a shipping fee appropriate to that item based on shipping address. 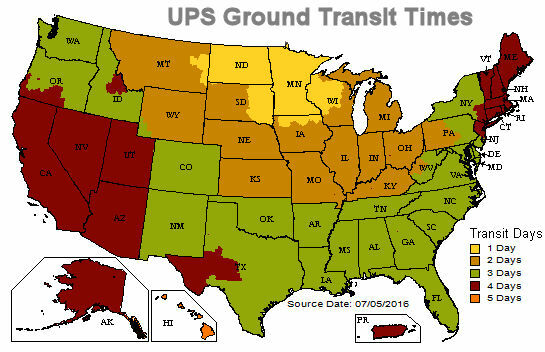 Standard UPS ground shipping typically arrives in 1-5 days of order. Normal shipment weight for UPS includes items up to 200lbs per container. Call our office to get faster shipping options and rates at 903-640-5000! Common Carrier Freight trucks can be requested for best pricing on large orders. All Freight Charge inquiries have to be called in at 903-640-5000 to get the best freight rates. Minimum order of $50.00 applies to lacing products. NO ONE can beat our prices except foreign belts!